If you're like most people, you go out to eat a lot. Chances are, you like to hang out at a major limited service food chain and are social when you're doin so. Between checking out specials on Foursquare, interacting with the brand on Facebook and Twitter and posting images on Instagram, there's a lot behind the inner workings of popular fast food brands on social media. Let's take a deeper look at the top players in social media when it comes to fast food. Coming in first place for top restaurants is Starbucks Coffee. Starbucks Coffee has a total of 31,381,422 likes and growing. Starbucks actually beat out the world famous McDonald's, who came in second place with 21,768,039 likes. There's just something about that caffeine boost and morning muffin that has people following Starbucks all over the web. Coming in first place, Starbucks coffee beat out everyone on the number of followers on Twitter, Google+ and Pinterest. Although, coming in second place for YouTube subscribers and scores on Klout, Starbucks really takes the cake in popularity on the Internet. Since Starbucks Coffee was second place for YouTube and Klout, what took the gold for these social media sites? Burger King took the crown for YouTube subscribers with 27,488 people following the famous viral video site. Taco Bell took the first place rank on Klout with a score of 85. 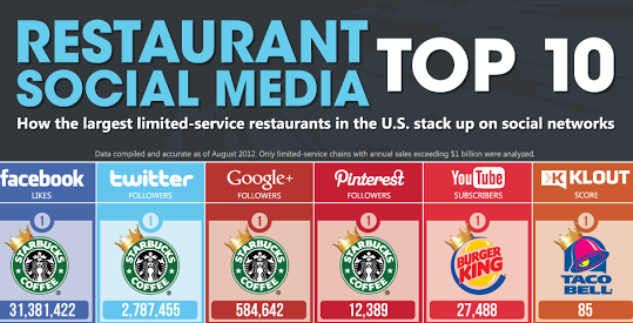 Check out the infographic below to learn more about the top restaurants in social media.